New invasive partnership wants homeowners to know about the invasive Callery Pear. AREA WIDE -- Callery pear, also known as flowering pear or Bradford pear, is among the most popular ornamental trees in the United States. The white flowers produced by the tree is one of the first signs of spring in the Midwest, and Callery pear is a common feature of plantings, urban trees, and housing additions. Unfortunately, the species is an aggressive invader of native forest, savanna, and prairie habitats across the eastern United States. 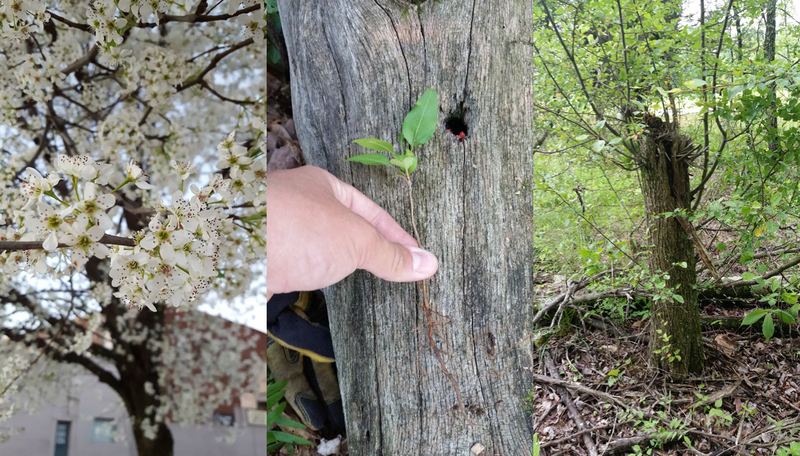 Expansion of Callery pear is a serious problem as the species outcompetes and suppresses native species that are much more desirable for wildlife habitat and forest health. Callery pear can be easily identified by its charismatic white flowers that appear in March/April as one of the first plants to bloom. It also has distinct waxy, egg shaped leaves and some varieties, especially where escaped, have large thorns. The fruits of the tree are small, typically the size of a dime or smaller with rough, brown skin. When first produced in spring, the fruits are quite hard but they soften over the course of the spring and summer, typically being consumed by a variety of birds and small mammals in late summer and fall. Callery pear trees grow very quickly and produce pollen and fruit as early as three years. The abundant fruits are quickly dispersed by birds, including European Starlings and American Robins. This results in new Callery pear trees growing in a variety of habitats where birds travel and roost including forest, fields, and under powerlines. Their continued use as an ornamental tree further contributes to the problem of expansion. In addition to their negative impacts on forests and wildlife, Callery pears are not a good choice for landscaping. Their tight branch angles and overall poor structure means they readily break under windy and icy conditions. This presents a danger to people and nearby structures where they are planted. Controlling this invasive species can be a challenge. Callery pear has a deep, strong tap root that limits pulling even small stems. Additionally, it actively stump sprouts meaning when cut or girdled, follow up herbicide treatment is necessary to kill an individual plant. Finally, the general form of most stems is rather spindly with leaves close to the stem (and each other). This means spray herbicide application has limited success. As is the case with many invasive species, successive mechanical and/or herbicide treatments are most successful in effectively controlling and eradicating this species. This message is a product of the newly formed Daviess—Martin Cooperative Invasive Species Management Area (CISMA). We are part of a larger organization known as Southern Indiana Cooperative for Invasives Management (SICIM). Our group seeks to provide assistance to the public on invasive species management in Daviess and Martin Counties. For more information or to get involved, visit: www.sicim.info and https://www.facebook.com/Daviess-Martin-CISMA-262962797961644/, the new Daviess-Martin CISMA Facebook page. If you are a landowner looking for more information, you can contact Invasive Species Specialist Emily Finch to set up a site visit on your property. Limited cost share is also available through the Soil & Water Conservation Districts for invasive plant control on up to 10 acres. Contact Finch at Emily.Finch@in.nacdnet.net or 812-482-1171 ext.3 for details.